If you haven't streamed Frank Ocean's stunning visual album Endless yet, what were you waiting for, aside from Apple Music membership? Let's be clear: this is a new album, with 45 minutes and 18 tracks' worth of new Frank Ocean, but it isn't the long-awaited Boys Don't Cry. The album that was originally going to be titled Boys Don't Cry, but now apparently boasts a different album name, is rumored to be dropping this weekend. Endless shows Ocean as he goes about his business (spoiler) building a spiral staircase, seemingly to nowhere. But it's not a one-man show as the Endless guest artists prove. There are a lot of them. It seems fitting that artists like James Blake and Radiohead guitarist Jonny Greenwood (among so many others) stop by to collaborate. Endless is a far more challenging listen than Channel ORANGE was, with lots of left-field electronica and computerized vocals. This said, it's also an incredibly complex, layered listen that rewards close attention, and this is probably a reflection of the sheer numbers of artists Frank Ocean collaborated with on this album. But before you get ready to do a deep-dive into the black and white world of Ocean's home-improvement projects, first check out who you should expect to hear. Jazmine Sullivan contributes vocals on a whopping four of the tracks. It's easy to see how she impressed Ocean: her debut single, "Need U Bad," was produced by Missy Elliott and reached the first place on Billboard's Hot RnB & Hip Hop chart, while her musical aesthetic isn't miles away from Ocean's own: she likes to incorporate retro elements into her music like soul and doo-wop. British electro darling James Blake was the man behind the synth on Ocean's cover of the Isley Brothers' "At Your Best (You Are Love)." Makes sense: Ocean contributed work to a track on Blake's 2016 release (which ironically was almost as long-awaited as Ocean's own 2016 album): The Colour In Anything. But Blake argued Ocean's influence was more far-reaching than a single track, telling Rolling Stone: "His music was a huge influence on the way I was writing the record, the way I was writing melodies." Radiohead's guitarist was on hand to provide "string orchestration" on "At Your Best (You Are Love)." Arguably, he did more than this though: what do the more experimental parts of this album sound more like than Radiohead? They received "Orchestra" credits on "At Your Best (You Are Love)." Om'Mas Keith tinkled the ivories for "At Your Best (You Are Love)," which, in a way, was no great surprise. He was the producer on Ocean's last album, channel ORANGE and he won a Grammy for his work. He's also a member of hip hop group Sa-Ra. 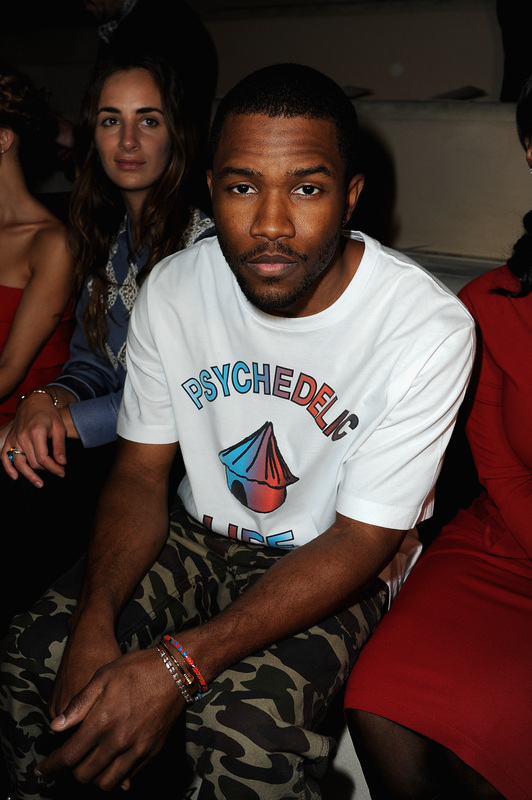 Who knew Frank Ocean was so into British electro? Sampha is widely known for his collaborations for the Mercury Prize winning electro outfit SBTRKT, and he's collaborated with everyone from Drake to Kanye West to Solange Knowles. Can't fault his credentials. He contributes vocals on "Alabama." Do you see how arty this guy's press photos are? This is who I see Frank Ocean becoming one of these days. The French pianist is a Renaissance Man and does freakin' everything: he composes music for films, he does experimental audio-visual projects, he invented the "ultrascore." In my next life, I'm coming back at Christophe Chassol. Anyway, he's behind the piano on "U-N-I-T-Y." He plays the synth for "Commes Des Garcons" and "Slide On Me" and the bass on "Florida." According to his Twitter account, he's a "West Coast producer. Frank Ocean Keyboardist. Commercial composer." Check out his stuff on Soundcloud, it's genuinely worth a listen. Noka was behind the "drum programming" on "Commes Des Garcons," "In Here Somewhere" "Deathwish (ASR)," and the programming on "Rushes To." He's a musician in his own right, who's touring right now. Joe Thornalley is also known as Vegyn, and guess where he's from and what sort of music he makes? You guessed it, he's British and makes electronic music. Anyway, he's also behind the drum programming on "Commes Des Garcons," "Slide On Me," "Deathwish (ASR)," and "In Here Somewhere." He did the programming on "Rushes To" and bass on "Slide On Me." Thornalley's involvement isn't as random as it might seem: his track was used in the Frank Ocean Calvin Klein advert, so these guys go back a little bit. Ben Reed, yes. This man plays bass for unparalleled dreamy British songstress Laura Groves. He contributes bass for "Commes Des Garcons," "Sideways," and "Rushes." He keeps a low profile, but you can check out his solo album here. Rita Zebdi contributes additional vocals on "Commes Des Garcons," which is kind of weird, because the only Rita Zebdi I can find on the internet is a relatively high-profile stylist. I'm going to call it: they met during one of Ocean's many fashion shoots and became friends. She's not a professional singer, thus "additional" vocals rather than vocals. This mysterious artist contributed synth and drum programming on "Device Control." Combs and Knapp have two things in common: a low-key internet presence and the song "Device Control," which Combs also did synth and drum programming for. Everyone on this track is hiding. She contributed drums for "Device Control," and there's limited information available about this artist. Alejandro Ghersi or Arca is a Venuzuelan electro producer based in Dalston, London, which confirms everyone's lingering suspicions as to where Ocean's been hanging out over the last few years. He's produced albums for the likes of Kanye West, Dean Blunt, and Bjork, which explains the experimentalism of Ocean's "Mine," which he has a programming credit for. Alex Giannascoli or Alex G. is a 23 year old guitarist who got big a few years back after releasing his tracks on Bandcamp. He plays guitar on "Wither," "Slide On Me," and "Rushes." This is a little gnomic: I'd assume the "Spaceman" guitar credits on "In Here Somewhere," "Rushes" and "Deathwish (ASR)" can be attributed to Jason Pierce (who has previously worked under the name J.Spaceman) of Spiritualized and who was one of the co-founders of minimal psych band Spacemen 3. Let's make our way further down the internet rabbithole of artists Frank Ocean used: Noh Life contributed drum programming (along with Thornalley) for "Sideways." According to the Twitter account attached here, they're a...uhh...fashion brand. Go figure. Michael Uzowuru did programming on "Rushes To," and he's a Nigerian-American producer, artist, and blogger who has previously collaborated with Vince Staples. Don't let those caps locks on the album credits fool you. He isn't Sebastian, but cult French dance label Ed Bangers' SebastiAn, a French DJ who has done remixes for the likes of Bloc Party and Beastie Boys and who has produced songs for the likes of Uffie and Kadinsky. He contributed programming on "Higgs" and "Rushes." Kind of a tricky one, since the legendary German fine art photographer doesn't actually directly contribute vocals to the music, but NME speculates that the robotic voice on "Device Control" is taken from an art piece by Tillmans. The eery track was also written by Tillmans. This list goes some way to prove that Frank Ocean is definitely the most popular man in music, and he's also been hanging out in London a lot, listening to electro. And if these are just the collaborators for his "visual album," wait until his Boys Don't Cry equivalent drops. I'd argue we'll probably see even more prominent collaborators he's contributed work for over the past few years i.e. Beyonce and Kanye West.